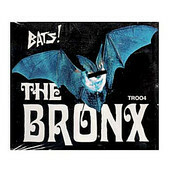 In Music We Trust - Bronx, The: Bats! Three new songs from Southern California's bloody rock 'n' roll threat The Bronx, the Bats! EP wastes no time, gets straight to the point, and delivers gasoline-soaked, burning fury that holds back no punches and just does what it does, 'cause it feels good and they love to rock. Embracing the creed "live fast and die young", the EP comes and goes in the blink of an eye. I'll give it a B-.